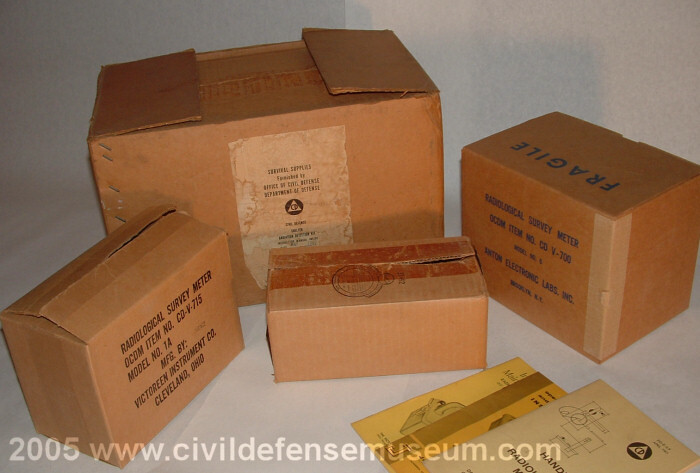 The CD V-777-1 kit was the standard issue kit for community fallout shelters. The original CD V-777-1 make-up was 1-CD V-715, 1 CD V-700, 1-CD V-750 and 2-CD V-742 dosimeters. 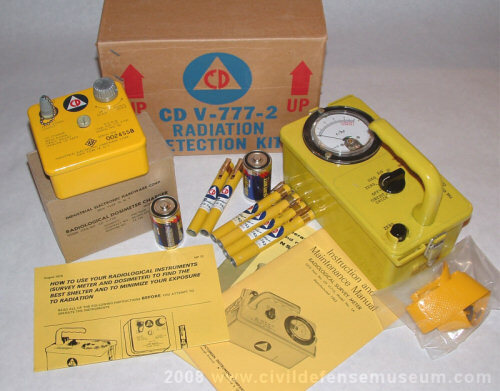 There were later versions of the CD V-777-1 but the only difference in kit contents was more CD V-742 dosimeters. 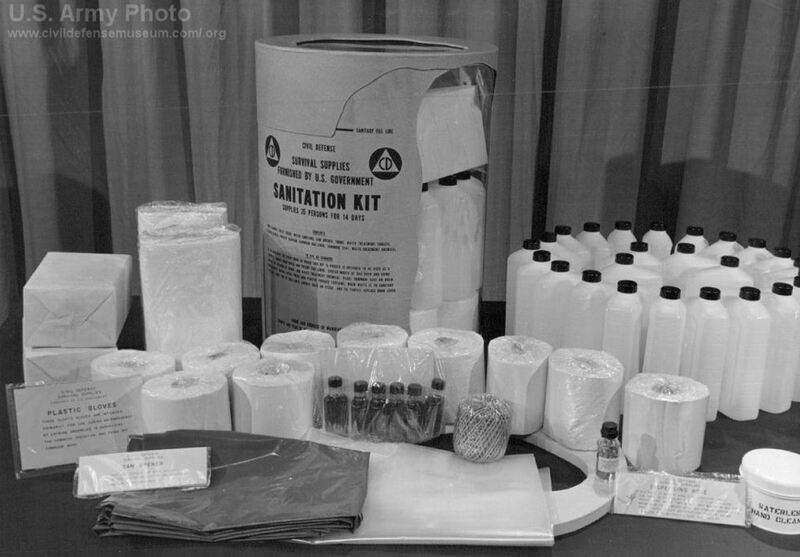 I received the kit pictured above from a gentleman in Detroit who had it from an original stock of shelter supplies in his business. The original shelter supplies were removed in the 1970s. He contacted me about the kit when he was ready to finally part with it. 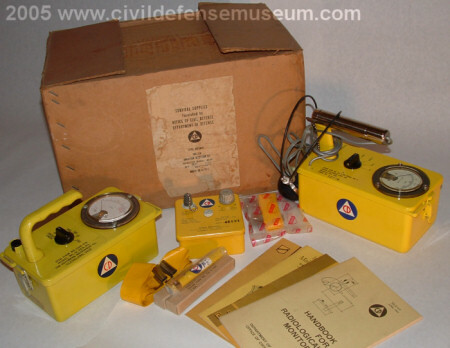 I was looking for an original issue kit like this since I saw one in the Corps of Engineers Photos that I put up on this site a few years ago. I received the kit in 2005 and the condition of the contents amazed me. It's one of the most pristine items in my collection. Click image or thumbnails below to see larger photos of this kit. Box packed with kit contents. 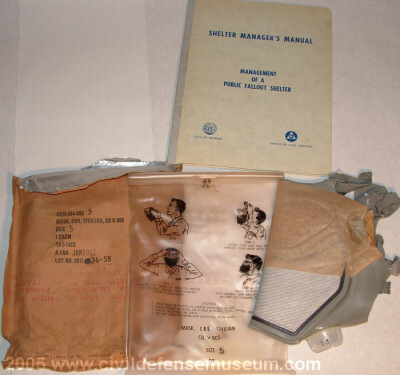 Also in the Detroit kit box with the instruments is a CD V-805 CBR Mask and Detroit Shelter Managers Manual. 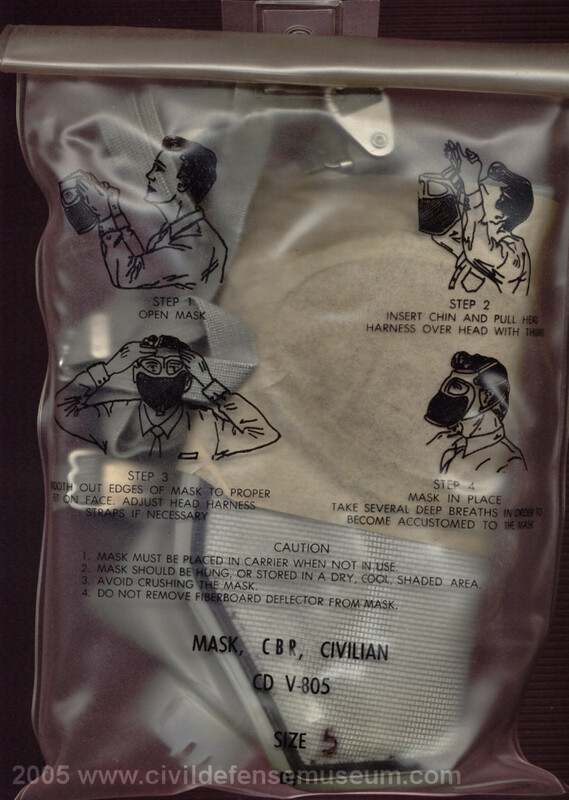 I've never seen a mask like this before and have never seen it referenced in any Civil Defense material that I have. It was packaged in a foil bag which was opened but the mask was never unwrapped. The mask still has the protective paper over the lenses and is in excellent condition. I don't know if these masks were standard issue in these kits or if this one just ended up in this kit. 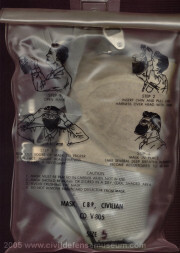 Some early versions of the CD V-777 kit were issued with masks but I don't know about the V-777-1 kits. The CBR stands for Chemical Biological Radiological. This mask appears to have just a particulate filter on it. I haven't opened the mask up all the way but the filter appears to be a cloth type of filter. Click the photos to see a larger version. 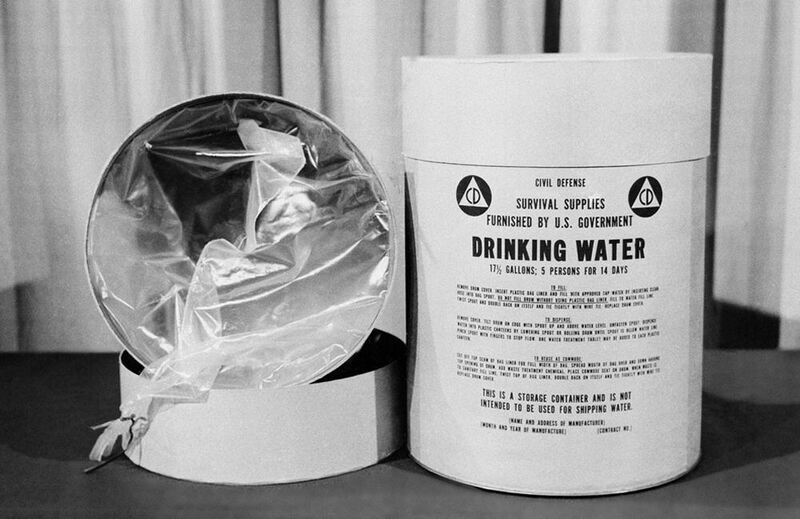 This is the CD V-777-2 Radiation Detection Kit. I haven't found an old (1960s era) list for the contents of this kit. 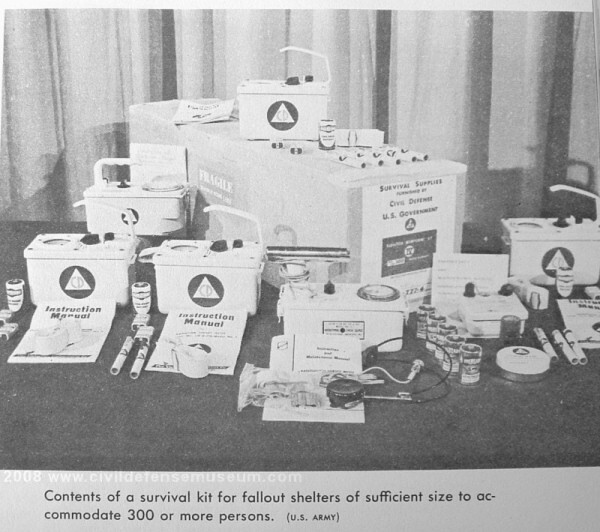 This kit is described in the FEMA CPG 2-2 as "the standard set recommended for public fallout shelters." 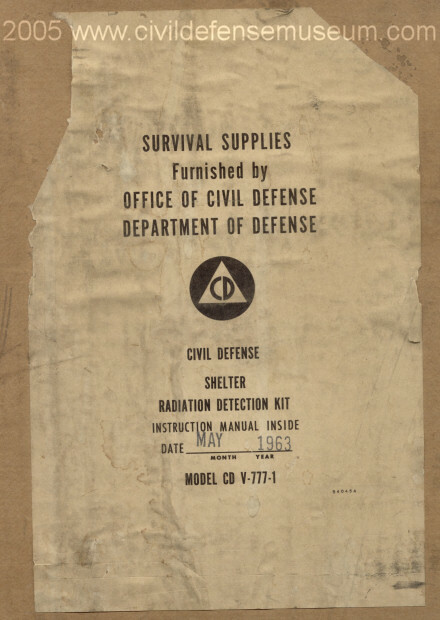 It's kind of interesting that FEMA came up with a "fallout shelter radiation set" so long after the National Fallout Shelter Program was abandoned. There was fallout shelter planning/surveying going on in FEMA through late 1992 but no funding of additional shelter supplies or stocking was taking place then. The FEMA CPG 2-2 is dated 1991 but I did find an earlier mention of the CD V-777-2 kit in the CPC (FEMA Civil Preparedness Circular) 83-1 dated August, 15 1983. 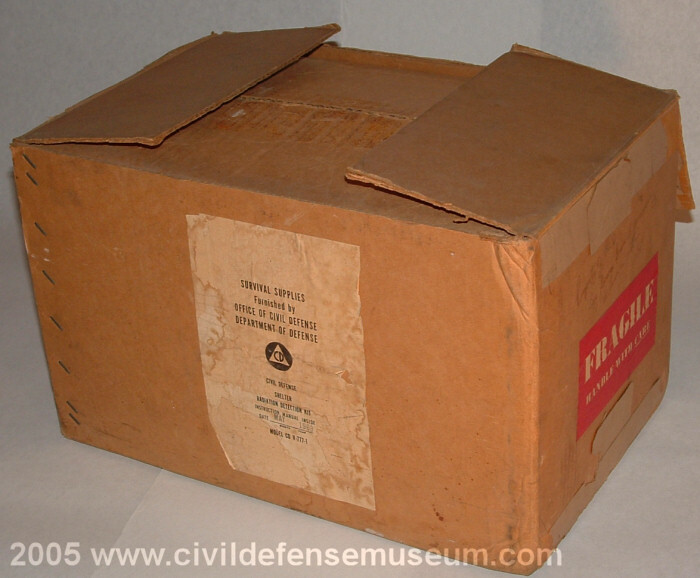 CPC 83-1 is a later version of the DCPA Circular 76-2 which covers shelter supplies. The DCPA 76-2 can be found on the fallout shelter supplies food page. I believe that the CD V-777-2 a result of FEMA's planning for "Crisis Relocation" in the late 1970s-1980s. I haven't found any documentation that says as much but the dates on the documents mentioned above seem to support that. 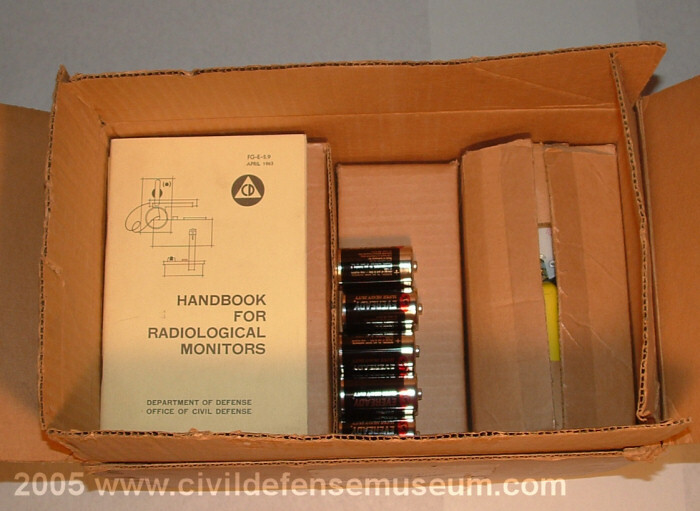 The FEMA CPG 2-2 book lists the kit contents as pictured above, 1-CD V-715 Survey Meter, 6-CD V-742 Dosimeters and 1-CD V-750 Dosimeter Charger. 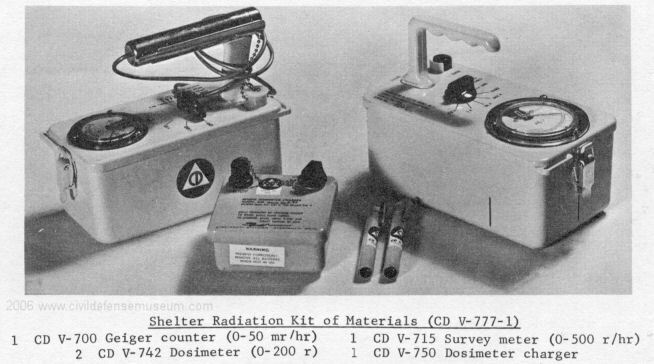 CD V-777-4 Radiation Kit - Prototype? Never Issued? Click photo to see larger. CD V-777-4 Photo From New Age Encyclopedia. Now here's a real mind-blower! I found this photo in an old New Age Encyclopedia. I forgot to look at the copyright date to see when the encyclopedia set was published but I assume it must have been the very early 1960s or late 1950s judging by what instruments are in the kit. Whenever I come across an old set of encyclopedias I always check the "C" volume to see what it has about Civil Defense. Well this is what I found in the old New Age Encyclopedia C volume. I was stunned when I realized what I was looking at in the photo. This is a CD V-777-4 kit according to the writing on the label on the end of the kit box. I've never seen a V-777-4 listed anywhere in any documents that I have. Evidently at least one did exist. From what I can tell in the photo the kit make-up is 4-CD V-710s, 1-CD V-700, 1-CD V-720, 1-CD V-750, 10-Dosimeters (probably a mix of CD V-730s and CD V-740s) and 1-CD V-787 Water Standard. Notice the size of the kit box. It's huge. Also of interest is the (U.S. Army) photo credit and the staging of the photo with the table and curtains as the backdrop. 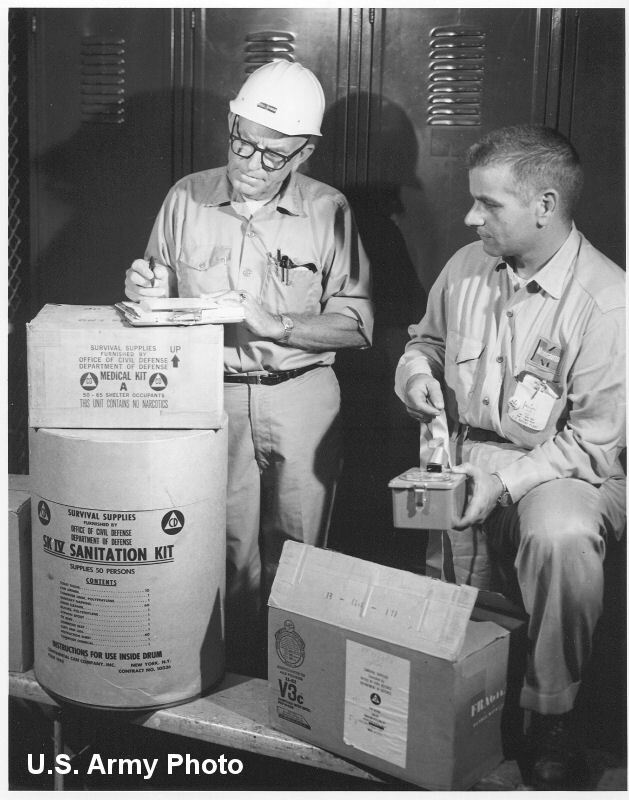 This photo appears to have been taken in the same setting at the prototype sanitation kit and prototype fiberboard water drum photos I have which are also credited as U.S. Army Photos. Actually this CD V-777-4 kit photo appears to have been taken in the same setting and time as the prototype sanitation kit photo because the creases on the curtains in the background are the same in each photo.